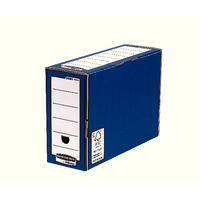 Atlanta Res Recycled Office Box c/w 5 Files Black A658026998 Pack of 1 High quality recycled Office Box for the easy storage and transportation of suspension files. 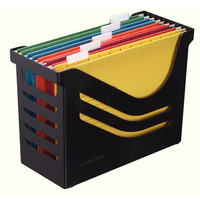 Made from 100% recycled polystyrene and supplied complete with 5 Jalema Euroflex files. Dimensions: W357xD152xH252mm. Colour - Black. 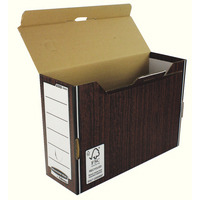 Bankers Box Woodgrain Premium Transfer Files (Pack of 10) 0005302 Pack of 10 Bankers Box Premium Flip-Top Files. A useful and convenient method of storing and transporting A4/foolscap papers. Manufactured from high quality corrugated, double thick board and supplied flat packed ready for easy assembly. Colour - Woodgrain. 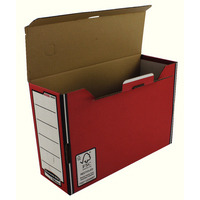 Fellowes Bankers Box Premium Transfer File Red/White 00058-FF Pack of 10 Bankers Box Premium Flip-Top Files. A useful and convenient method of storing and transporting A4/foolscap papers. Manufactured from high quality corrugated, double thick board and supplied flat packed ready for easy assembly. Colour - Red/White. 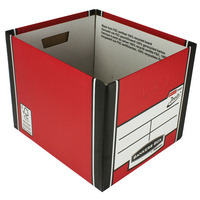 Bankers Box Red Presto Bankers Box Premium Storage Boxes (Pack of 10) 7260701 Pack of 10 Bankers Box Premium Storage Box. The most popular storage box. Cleverly designed and easy to assemble, each unit comes complete with lift off lid, convenient tote handles and large labelling area. Ideal for use on steel shelving. Red/White.